The iMZ220 and iMZ320 mobile printers build on the current MZ series with the addition of Bluetooth connectivity to Apple iOS, Android, Windows Mobile and Blackberry platforms. Supporting smart phone and tablet technologies, as well as mobile computer technology, the iMZ series gives users a real choice of mobile platforms to suit their business requirements. 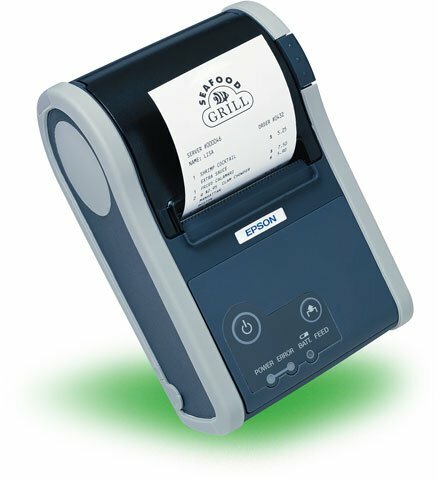 Compact and lightweight, these easy-to-operate mobile receipt printers are a great entry-level model for printing simple 2-inch and 3-inch receipts. Epson, a leading supplier of value-added Point of Sale (POS) solutions, announced that its popular Mobilink P60 thermal printers are now available with Bluetooth connectivity for the iOS mobile operating system. Available in both receipt and label versions, the new Mobilink devices allow retail and hospitality customers to take advantage of wireless printing from all handheld iDevice peripherals, including Apple’s iPad, iPod touch and iPhone, connecting via the Bluetooth 2.1 + EDR wireless networking standard. Bluetooth’s open standard wireless communications protocol creates a stable, reliable connection and is a cost effective option for short-range transactions of up to 30 feet. Epson’s new Mobilink products meet the skyrocketing customer demand for highly reliable, Bluetooth-based mobile printing from iDevices throughout retail stores and hospitality environments. The New Star SM-S220i Is Now Available! Star Micronics is proud to bring you the SM-S220i portable Bluetooth printer. The SM-S220i is an industry first, with the ability to connect using Bluetooth to not only devices running operating systems such as Windows and Android, but to devices running iOS, such as the iPad, iPhone and iPod Touch. The SMS220i’s agile features make it the perfect solution for mobile point of sale and payment applications. Thanks to MFi certification from Apple, the SM-S220i is able to pair with iOS devices unlike common Bluetooth printers which only support the iOS incompatible SPP Bluetooth protocol. You may have seen other MFi certified Bluetooth printers on the market, but Star’s SM-S220i is the first to support both iOS and the SPP protocol meaning one printer will work with all devices. Customers will no longer need to purchase separate models, one for iOS and one for Android. Instead, customers can purchase a single model, the SM-S220i, and be assured that it will work with any Bluetooth enabled device. Star is a proud long time supporter of printing from iOS and Mac OS X environments and is proud to add AirPort Express to our support line up! Follow the link at the end of this post for a step by step illustrated guide to learn how to print to a Star printer which is connected to an Apple Airport Express. Simply connect your Star Micronics Printer to the AirPort Express via USB cable and voila! Secure wireless printing achieved from your tablet, smart phone, or computer – applicable for iOS and Android devices alike. For any help finding a Star printer for your Apple device, contact us at BarcodesInc. Star Micronics has announced the latest advancement in its portable printer line, the SM-S220i Bluetooth printer compatible with the Apple iOS devices. 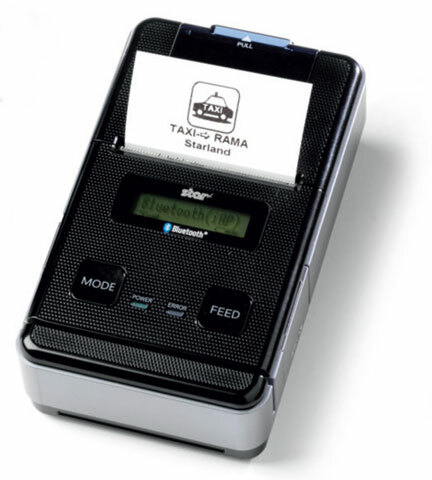 The SM-S220i portable receipt printer is Star’s first printer approved by Apple, Inc. The SM-S220i printer, unlike most printers, can pair via Bluetooth with the iPod touch, iPhone and iPad. The SM-S220i printer has made it easier than ever to print from the Apple iOS devices that have become ubiquitous in the Point of Sale and Payment industries. Not only can Star’s SM-S220i printer pair with iOS devices but it also supports the Bluetooth SPP protocol, meaning it can pair with devices running most other common operating systems as well. As one of the first printers available with both of these Bluetooth technologies in one device, the SM-S220i will make it easier for resellers to offer a simple hardware solution to merchants that is compatible with all of the popular mobile platforms. Smartphones and tablets have become commonplace in all business types. They offer advanced computing and wireless connectivity on the go whenever and wherever its needed. While they offer a lot of functionality to the average consumer, these devices can also be used in more professional settings to manage inventory, conduct sales, or track a customer base. Adding the ability to read barcodes to your iPad or iPhone can quickly turn it into a data collecting tool you can use for a wide range of applications. While there are many apps out there that turn the camera on your device into a barcode scanner, most users find that these apps are not able to keep up with consistent and volume of scanning an enterprise application requires. This is where the Socket line of cordless scanners are the perfect solution for any iOS device. Intermec announced a new HTML5-capable browser, allowing for the development of OS agnostic web applications that can run on iOS, Android and select Intermec rugged mobile computers, enhancing workflow efficiency and offering increased flexibility to mobile workforces. Unique to the industry, Intermec’s HTML5 offering includes a true web browser application, based on WebKit, for multiple models of Intermec’s handheld computers for Windows Mobile and Windows Embedded operating systems. Additionally, Intermec’s HTML5-capable browser supports applications designed to run either on-line (connected to a web server), off-line (no connection to a web server) or a combination of the two. Intermec’s HTML5 browser for Windows Embedded Handheld is not only built on the state-of-the-art Webkit engine, like iOS and Android, but it is offered conveniently preloaded and free of licensing fees or license activation requirements on Intermec CN50, CS40, CN70, CN70e and CK70, and is available for free download for the CK3, CK71 and CV41. HTML5 applications that run on consumer-grade smartphones and tablets can now also be run on these select Intermec rugged mobile computers without changes or rewrites.